Where Did I Get My Tunisian Hooks? I have received a lot of email pertaining to where I have picked up my Tunisian Crochet Hooks as seen in my videos. I actually had to get them online as I find purchasing a set is a lot cheaper than trying to pick up 1 or 2 sizes. These sizes range from 2.0 mm to 8.0 mm. For my American Friends, they are ranging from D to L sizes. They are just over 10.5″ long each. Though I have read the reviews on this product. I never had a problem. The average customer review is 4 out of 5. I think more of the squeaky wheels are commenting on this product than the people actually satisfied with it. Keep in mind, one of the reviews said “Cheaply Made”… ummm yeah, what do you expect for an entire set for $9.10 USD. If you are looking to experiment with Tunisian and don’t want to invest a lot of money, these would be a great starter set to try. If you love Tunisian and you think it’s something you want to play with further, you can always invest in higher quality tools in the future. 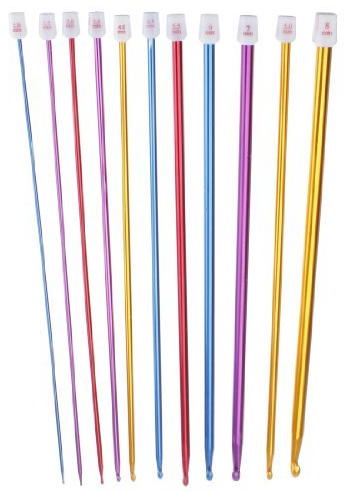 See this set at Mikey’s Online Shoppe – 11Pcs 2-8mm 10.6″ Multicolour Aluminum TUNISIAN/AFGHAN Crochet Hook Knit Needles. This entry was posted in Product & Service Reviews, Tunisian and tagged Amazon, Buy, Crochet, Hooks, Mikey, Tunisian. Bookmark the permalink. 20 Responses to Where Did I Get My Tunisian Hooks? I’m looking for 19 mm Tunisian hook for a sweater to crochet. I haven’t been able to find one. Do know a source? http://www.yarntools.com/crochet-hooks.html There is an email address on that site for you to order the hook. There are plenty of 19mm (size S) regular hooks out there but that is the only Tunisian hook I found. I love Tunisian crochet! But when making an afghan even the 14″ hooks can be hard for me to work with, so I finally invested in a set of Knitter’s Pride Dreamz interchangeable hooks. They are GREAT! I use DENISE INTERCHANGEABLE CROCHET HOOK SET when I do Tunisian crochet. I bought a set of bamboo ones and a set of these. I would rather use these than the bamboo ones. Yes I agree the Bamboo ones I got are horrible , they’re not straight and the hook part isn’t cut right, it won’t pick up the yarn! I love working with my Tunisian hooks. I make Afghan/blankets with mine. My husband ground down the end & attached a plastic tube. Made doing the rows much, much easier. Then I saw that they do have Tunisian hooks with something like that. Here I thought I had an original. Lol. My first ever Tunisian hook my husband found at a thrift store it has a hook at either end. The down side, I have no idea size it is. There are no markings on it at all. I don’t even know who made it. So far that is original. Lol. Barbara, hold it against one of your regular hooks of similar size until you find they are the same. Then either write the size on it with a permanent marker or lightly scratch it onto the side of the hook. I bought some of those hooks many years ago and that is what I had to do. I hope this helps you out. looking for red heart I love in canada???? Fabric Land is the only place I Know of in the larger retailers in Canada. I have the Tunisian hooks but would love to get the swivel hooks. I find the little wooden ones from Clover are fun to experiment with. They are double ended which is fun to try. I’m going to start a project that says I need the Tunusian hook and I had already planned to purchase the very ones you bought regardless of comments I too read, but then I noticed the pattern said it should be double hooks?? I’m fairly new to this so is there different tunisian hooks? Double hooks have a hook on each end. I’ll link a picture to show what I mean. They are heaps of fun to play with and I would recommend buying them if I were you, You can then use them as a normal tunisian hook as well. Double ended hooks are sometimes called “crohooks”. Hope that helps.